From neurosciences to opera, schools improvement to drug discovery, the University of Cape Town (UCT) Trust, a United Kingdom (UK) registered charity, has played a significant role in promoting UCT and building support for the institution in the UK and Europe for nearly 30 years. Established in 1990 by Dr Stuart Saunders during his time as vice-chancellor of UCT, the trust has raised over £25 million (approximately R450 million) to date from corporations, foundations, alumni and friends, to strengthen infrastructure, fund research programmes and bursaries, and support outreach projects. The trust is governed by an engaged and dedicated board of trustees currently chaired by alumnus Sir Frank Berman KCMG QC, a renowned barrister and former diplomat. Two-thirds of the board are prominent UCT alumni and they share trustee duties with a former high court judge, a recent UK High Commissioner to South Africa, and a South African journalist and author. Aside from their personal support for various projects, the trustees are also enthusiastic advocates for UCT, giving generously of their time to promote the university and share news of the institution’s successes and challenges. In a recent expression of their support for education, teaching and research at UCT, the trust donated £100 000 (R1.75 million) to the Max Price and Deborah Posel Scholarship Programme in honour of Dr Price’s 10 years as vice-chancellor. This gift will support postgraduate study and help to build the next generation of academics at UCT. There are many buildings around campus boasting plaques which celebrate infrastructure support from the UK – including from the Wolfson Foundation and the Garfield Weston Foundation, both of which primarily support UK institutions. Infrastructure support from the UCT Trust is also substantial. It has raised significant funds for the Institute of Infectious Disease and Molecular Medicine (one-third of the total cost of the project) and new chemistry laboratories, as well as making considerable contributions to the Drug Discovery and Development Centre, a new residence building, and microscopy equipment. Most recently, the newly established Neurosciences Institute has benefited from major funding – more than half the total raised was facilitated by the UCT Trust. The Schools Improvement Initiative (SII), which is addressing the ongoing crisis in the South African education system, was adopted as the trust’s priority project in 2014 and a fundraising drive was launched at a special event at the annual Chelsea Flower Show in London. 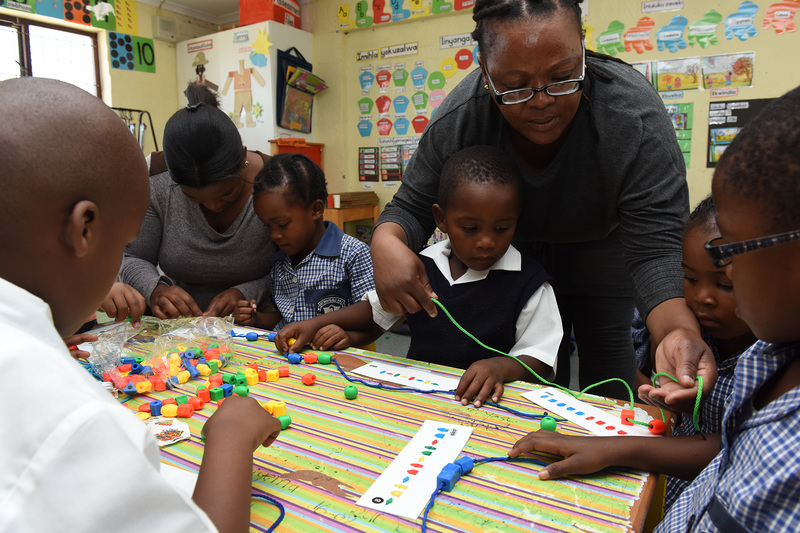 To date, the trust has contributed some R6 million towards the work of the SII, enabling the initiative to consolidate and expand its work in Western Cape township schools. Much of this support has come from UCT alumni, keen to help UCT make inroads into improving the quality of education in the province. Over R4 million has also been raised for the UCT Opera School which, in collaboration with Cape Town Opera, trains talented young South African singers, many of whom emerge from the townships and end up on the world stage. This funding has come from foundations, alumni and friends, and through fundraising evenings featuring Opera School students and recent graduates at various venues in London. Most of this has gone towards establishing an endowment for the school which will guarantee a legacy for future generations in the study and performance of opera in South Africa. The Distinguishing UCT fundraising campaign to grow the universityʼs endowment – a permanent source of funding that will enhance UCTʼs ability to work towards its vision and mission – was launched in the UK. The UCT Trust is leading the global charge, with donations from UK alumni reaching close to R100 million. Bursary support is always a priority for the trust. Programmes are funded annually by various foundations and individuals, and the UK Alumni Bursary Programme supports both undergraduate and postgraduate students from historically disadvantaged backgrounds. Alongside the above, the trust organises a programme of events throughout the year to promote awareness of UCT and ensure that the community of alumni in the UK remain engaged with their alma mater. The majority of these take place in London, where most of the alumni live and/or work. The London Lectures series has featured academics reporting on the work being carried out in various faculties, covering topics such as Future Water, perinatal mental health, and enabling African leadership. A Vice-Chancellor’s Reception is held each year, while opera evenings, gatherings at South African theatre productions and alumni receptions and lunches outside of the capital are arranged as often as possible. The Chancellor’s Circle of Donors, all of whom have supported projects at UCT to the tune of R500 000 or more, are invited to events organised by the trust, such as dinners with Chancellor Graça Machel. The trust is run on a day-to-day basis by two part-time consultants who operate out of an office in Surbiton, Surrey.